Sulfate free surfactants. Hair care system. Beauty pure and simple. 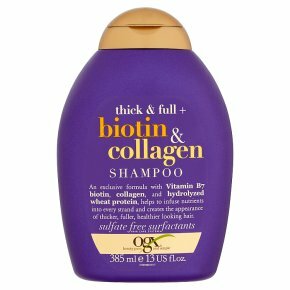 An exclusive formula with Vitamin B7 biotin, collagen, and hydrolyzed wheat protein, helps to infuse nutrients into every strand and creates the appearance of thicker, fuller, healthier looking hair. Why You Want It... Discover thicker, fuller and more abundant looking strands! Helps to thicken and texturize any hair type! Immerse your skinny strands in this super volumizing formula to help create fuller looking, shiny hair. Directions for Use... Apply shampoo generously to wet hair, massage into a lather through to ends, then rinse the hair thoroughly. After shampooing, follow with conditioner. For best results use in conjunction with other OGX products.